MACOMB, IL -- Western Illinois University's Dance Marathon and the Macomb McDonald's are "McDancing" For the Kids today (Thursday, Oct. 12). 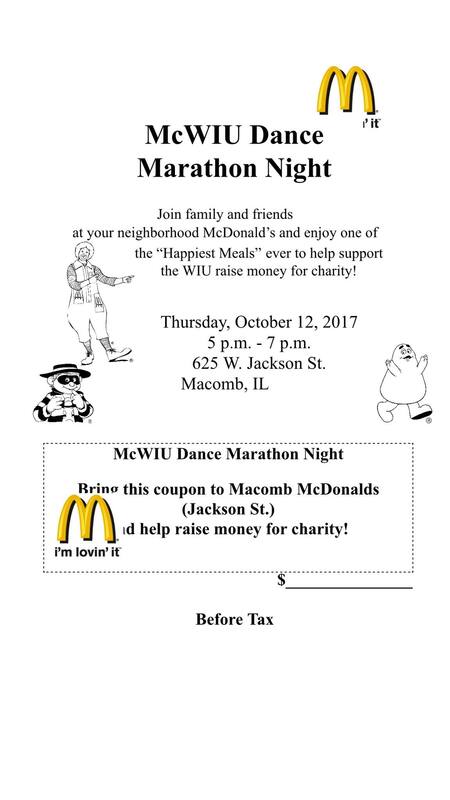 From 5-7 p.m. today (Oct. 12), 15 percent of each order -- using the attached coupon -- at the Macomb West Jackson Street McDonald's locations will be donated to the WIU Dance Marathon. This "McDance Marathon" event is part of the WIU student organization's year-round effort to raise money for Children's Miracle Network hospitals, St. Louis Children's Hospital and SSM Health Cardinal Glennon. The year-long event culminates Feb. 24, 2018, with the 12-hour Dance Marathon, which honors the 12-hour shifts of doctors and nurses, as well as children who are unable to stand. Western's Dance Marathon is entering its fifth year on the WIU campus, with this year's goal set at $150,000. Donations are welcome, and may be made by visiting tinyurl.com/wiudm18 or emailing dancemarathon@wiu.edu. Last year's event raised $123,200. For more information on the WIU Dance Marathon, visit facebook.com/WIUDM. Follow the Dance Marathon on Facebook and Twitter (@WIUDM).